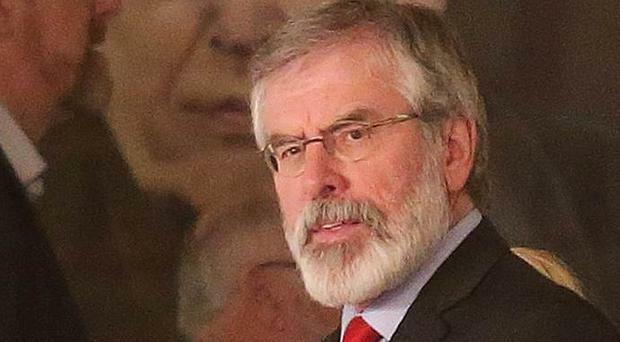 Sinn Fein's president Gerry Adams has been at the forefront of the Stormont talks process. Photo by Jonathan Porter / Press Eye. Gerry Adams has said the "watershed" Assembly election result shows a united Ireland is achievable. The Sinn Fein president said that despite the result, "unionists still have a majority" among the population in Northern Ireland, the BBC reported. "There is still a big onus on us to persuade them that's where their future would best be developed," he said. "I don't want to see the unionists in the place that nationalists used to be in. "We need an entirely new Ireland, we need an Ireland which unionism is comfortable with, that they have an ownership of and that they agree to." When asked if he now envisaged seeing a united Ireland within his lifetime, the 68-year-old said: "It depends how long I live, but my hope is - yes." "It's not exactly tangible, it's a sense of expectation, a sense of hope, a sense of doabilty," Mr Adams said. "Ten years ago Scottish independence was a minority occupation for men in kilts. "Most people in Scotland hadn't really bought into it, but now they have. The same thing is going to happen, in my opinion, for those of us who want Irish unity." UUP MP Tom Elliott said he could not be persuaded a united Ireland would be of benefit to him. "There is no surprise he is saying this given they had a good election, but it has been said before. "Economically and socially I always feel we are better within the larger UK and that has been shown over recent years during the economic downturn. Not only in the UK, but also Ireland and we are able to survive much better." Reacting TUV leader Jim Allister said: "This triumphalism and bombastic approach by Gerry Adams is nothing new. "But to me as a unionist it does raise serious questions for me as to why therefore any unionist would want to facilitate the Adams' agenda by holding at the heart of government a party with that commitment. "Sinn Fein is not at Stormont to make Northern Ireland work, it wishes to go to Stormont to advance the cause of a united Ireland."